This picture of a T-14 Armata tank was taken by Steven Zaloga at the Army 2017 show outside Moscow at the Patriot Park in Kubinka. More pictures of the show can be seen at this facebook post. Am I the only one out there looking at the T-14 and thinking that this tank is too tall and large. Don’t get me wrong, I understand that modern armor by it’s very nature needs more room. I just get the feeling that they should pull a few old Soviet tank designers out of retirement and ask them to rearrange components so the overall size of the tank is smaller. It’s actually still slightly smaller than the Abrams. It just looks huge when compared with T-90s. However it still seems larger than it needs to be. Since there’s no turret crew what the hell are they storing in the area directly under the turret, between engine and crew capsule? A gigantic ammo rack? 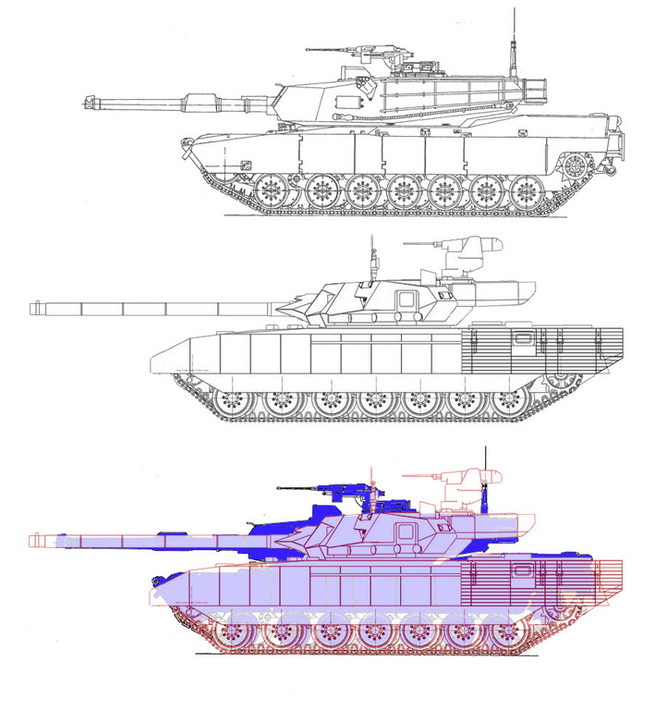 We still have no info on what the autoloader on the Armata looks like, but there’s probably no use in theorizing until more data hits public eyes. Thank you this does a great job of putting the two tanks in greater perspective.As a ex tanker, I love the idea of roomy turrets like that of the M-1. I suspect the Russians are going to hold off for quit a while before they let a foreigner climb into their tank for fear of giving away that the top armor is some thick modern blend designed to protect from overfly top attack munitions. With all three crewmen up front together it does reduce the percentage of the tank which requires heavy armor. On the other hand if anything goes wrong with the firing mechanism no one will be able to just reach over and fix or straighten out the mistake. I guess we are lucky Russia can’t afford to buy many T-14s and is stuck updating their T-90s and T-72s.